Last month Make Up Academy (MUA) had 30% off off their items online to celebrate reaching 30,000 FB followers (or something like that). Anyhoo, I purchased a few things as can be seen from the pics. Clockwise from left: MUA Mystical Glitter Nail Polish in Starfish & Jellyfish, Undressed Eyeshadow palette, 2 x Extreme Felt Liners, Extreme Curl Mascara. You can see the glitter in the Mystical Glitter Nail polish a little better. I read that the undressed palette is a very good dupe of Urban Decay's Naked palette and the only main difference being the price so I can't wait to test this out. So how much did this all cost after the 30% off? Under a tenner! (£9.75 to be precise). 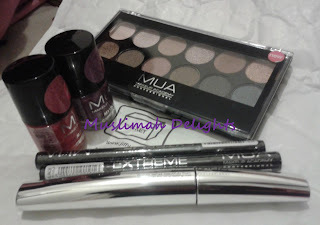 Are you a MUA fan? What are your must haves?